If you are part of the Resistance to Trump, the Georgia 6th Congressional District’s special election Tuesday has given you something to cheer about. Feel free to read the rest of this article as if it’s the opening crawl of a Star Wars film, laying out how the Rebel Alliance has their first minor victory against Darth Trump (or Sessions, or Kushner or Bannon, etc.). The fight is far from over, but 30-year-old Jon Ossoff just might be the New Hope the Democrats are looking for. The 6th District was up for a special election because sitting Republican Rep. Tom Price was brought up to the big leagues to be President Donald Trump’s secretary of health and human services. While Republicans have held this district for close to 40 years, it’s been changing. Yes, there are plenty of Paneras and Starbucks, but you also have In & Out Burger, and the whole Buford Highway Corridor has some of the best hole-in-the-wall Vietnamese and Mexican food in the Southwest. The district is 13 percent African American and 13 percent Latino, and although affluent conservative whites have migrated into North Fulton County into places like Alpharetta, closer to the city, places like Cobb and DeKalb counties are nothing like the conservative power bases that supported Newt Gingrich when he repped the district in the ’90s. There was a scrum for the seat, with 11 Republicans, a few Democrats and a few independents in the race. Millions of dollars poured into the race, mostly in attack ads against the Democratic front-runner, Ossoff. The GOP dredged up old YouTube videos of Ossoff cosplaying as Han Solo from his college days at Georgetown and suggested that he was too “immature” to be in Congress. Of course it kinda backfired—what could be more inspiring to Democrats seeking to battle the evil that is the Trump White House than a Star Wars-themed election? Ossoff embraced the role fully. A 30-year-old documentary filmmaker who worked for and considers Democratic Georgia Rep. John Lewis his mentor (Obi Jon Lewis, obviously), Ossoff made a startling contrast with the GOP front-runner, Karen Handel. Handel is a former Fulton County Board of Commissioners chair and Georgia secretary of state; she’s Georgia through and through; and her home base of North Fulton is where she draws her strength. However, in this first round of voting, Ossoff had the Force on his side. He exceeded expectations by winning just over 48 percent of the vote, which is better than Hillary Clinton did just eight months ago (she lost to Trump 47 percent to 48 percent). 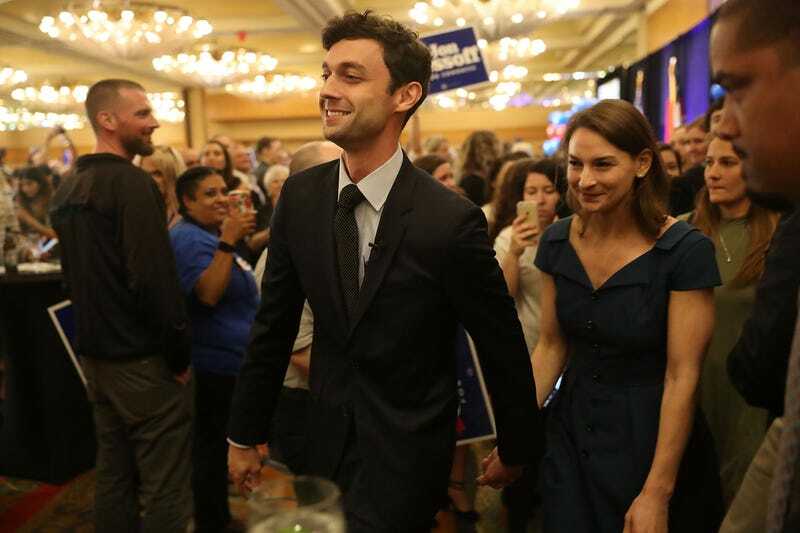 Because no one got over 50 percent of the vote, however, there will be a runoff between the top two vote getters, Ossoff and Handel (who got 19 percent), on June 20. Ufot, however, cautions anyone who thinks this special election is the end of the battle. The Voting Rights Act requires that voter registration for any election end no more than 30 days before citizens vote. But Secretary of State Brian Kemp is trying to claim that the June 20 runoff is just an extension of Tuesday’s special election, and therefore voter registration actually ended March 20. A 90-day blackout of voting is clearly voter suppression and exactly the kind of dirty trick that could keep Ossoff from adding to his lead when he faces Mandel in June. However, for now, there is victory; the Empire took a hit. 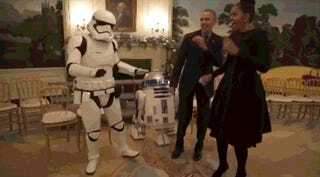 So time for fireworks, and GIFs of Democrats dancing with Ewoks across the galaxy. The real battle starts tomorrow, when the fundraising and focus will be on the two major-party candidates, and a race in which everyone from the Democratic Congressional Campaign Committee to the White House will have a lot at stake. Help the Resistance, Jon Ossoff; you’re their only hope.